General (1) This Section applies to the design and construction of interior and exterior stairs, steps, ramps, railings and guards. Download "9.8.1.1. General (1) This Section applies to the design and construction of interior and exterior stairs, steps, ramps, railings and guards." 3 Column 1 Column 2 Column 3 Column 4 Column 5 Column 6 Column 7 Stair Type All Steps Rectangular Treads Rise, mm Run, mm Tread Depth, mm max. min. max. min. max. min. Service and mezzanines in live/work no limit no limit 355 no limit units (1) Private (2) Public (3) Notes to Table : Service stairs serve areas used only as (1) service rooms or service spaces and stairs that serve mezzanines not exceeding 20 m 2 within live/work units. Private stairs are interior stairs within (2) dwelling units and exterior stairs serving a single dwelling unit. Public stairs are all stairs not described as service (3) stair or private stairs Dimensions for Rectangular Treads (1) The run and tread depth of rectangular treads shall conform to Table (2) The depth of a rectangular tread shall be not less than its run and not more that its run plus 25 mm Dimensions for Angled Treads (1) Angled treads in required exit stairs shall comply with Article (2) Except as provided in Article , angled treads in other than required exit stairs shall have an average run of not less than 200 mm and a minimum run of 150 mm. 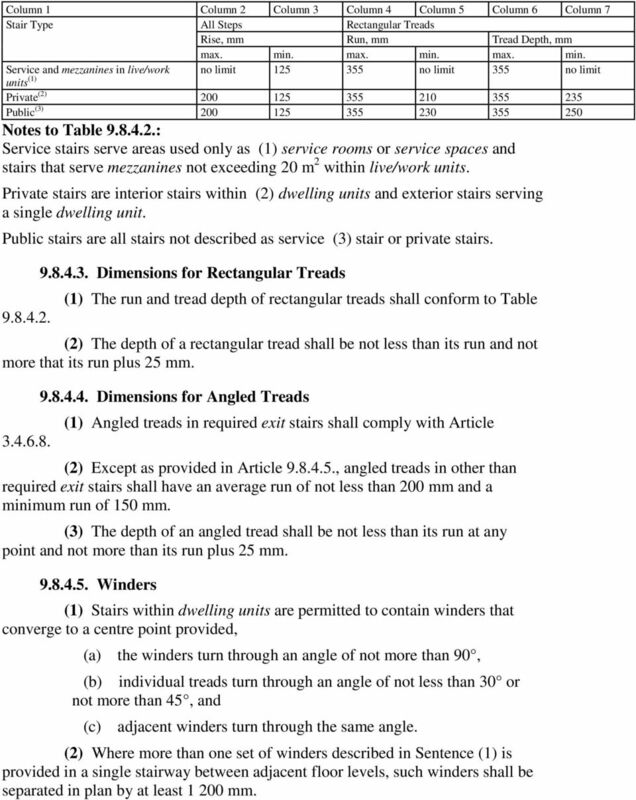 (3) The depth of an angled tread shall be not less than its run at any point and not more than its run plus 25 mm Winders (1) Stairs within dwelling units are permitted to contain winders that converge to a centre point provided, (a) the winders turn through an angle of not more than 90, (b) individual treads turn through an angle of not less than 30 or not more than 45, and (c) adjacent winders turn through the same angle. 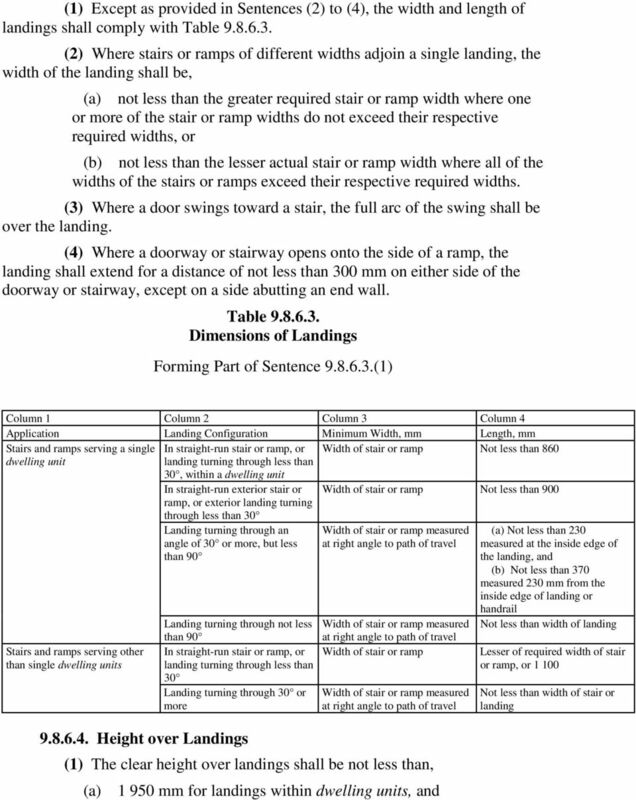 (2) Where more than one set of winders described in Sentence (1) is provided in a single stairway between adjacent floor levels, such winders shall be separated in plan by at least mm. 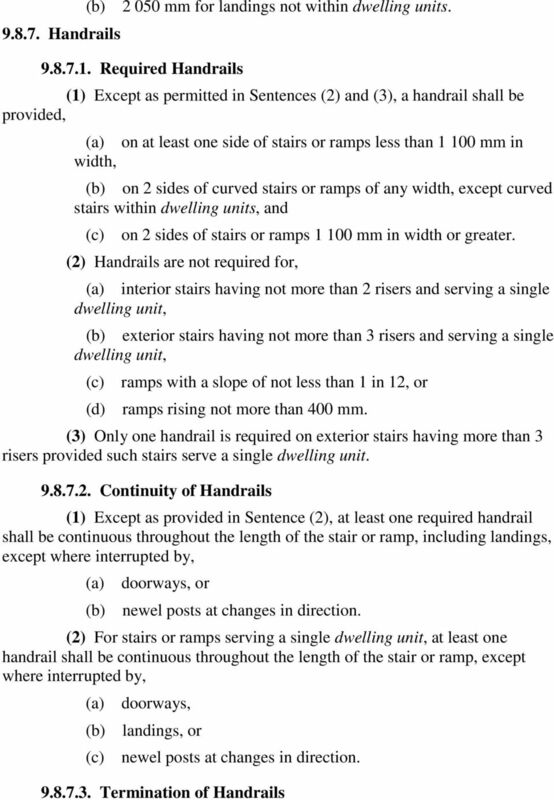 8 (1) Handrails shall be terminated in a manner that will not obstruct pedestrian travel or create a hazard. 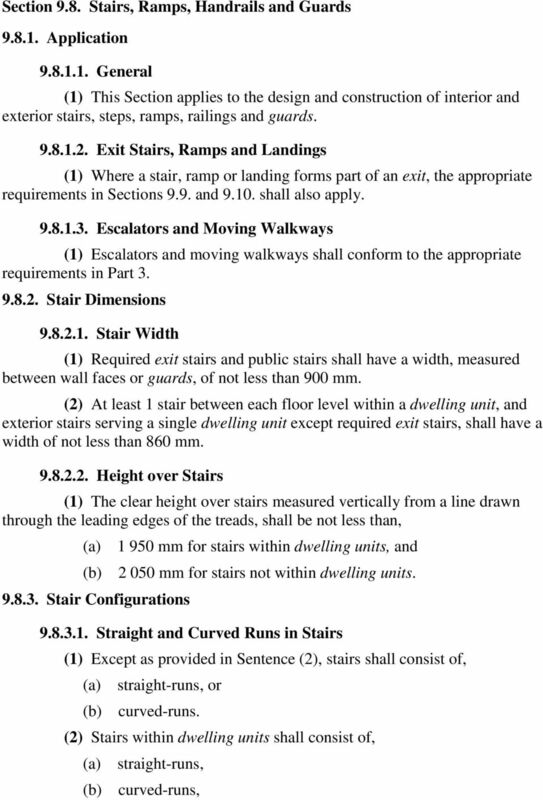 (2) Except for stairs and ramps serving a single dwelling unit, at least one handrail at the sides of a stair or ramp shall extend horizontally not less than 300 mm beyond the top and bottom of each stair or ramp Height of Handrails (1) The height of handrails on stairs and ramps shall be measured vertically from the top of the handrail to, (a) a line drawn through the leading edge of the stair treads served by the handrail, or (b) the surface of the ramp, floor or landing served by the handrail. 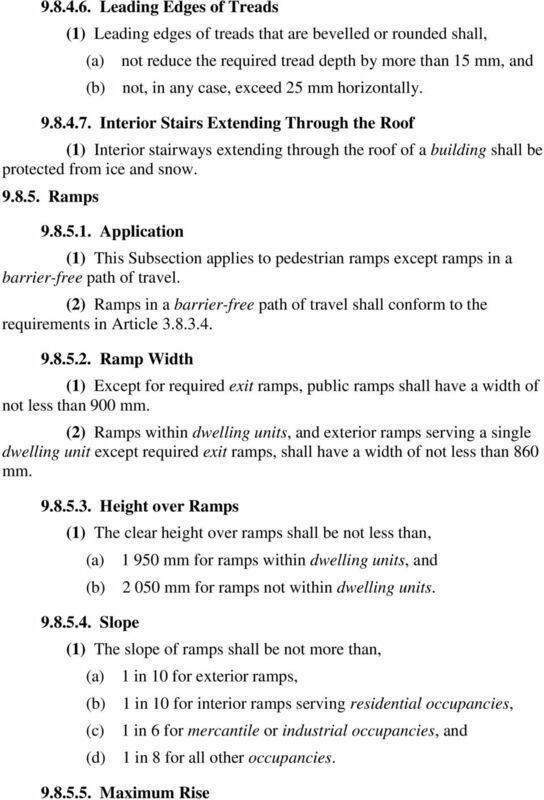 (2) Except as provided in Sentence (3), the height of handrails on stairs and ramps shall be, (a) not less than 800 mm, and (b) not more than 965 mm. 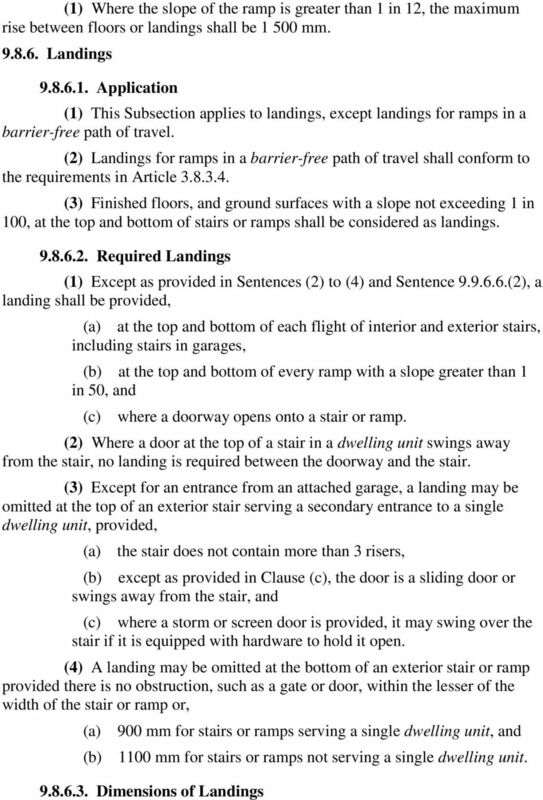 (3) Where guards are required, handrails required on landings shall be not more than mm in height Ergonomic Design (1) A clearance of not less than 50 mm shall be provided between a handrail and any surface behind it. 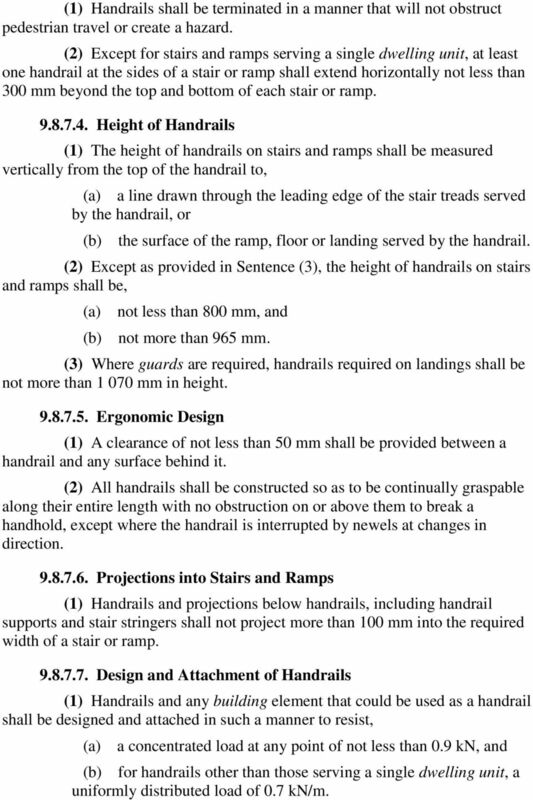 (2) All handrails shall be constructed so as to be continually graspable along their entire length with no obstruction on or above them to break a handhold, except where the handrail is interrupted by newels at changes in direction Projections into Stairs and Ramps (1) Handrails and projections below handrails, including handrail supports and stair stringers shall not project more than 100 mm into the required width of a stair or ramp Design and Attachment of Handrails (1) Handrails and any building element that could be used as a handrail shall be designed and attached in such a manner to resist, (a) a concentrated load at any point of not less than 0.9 kn, and (b) for handrails other than those serving a single dwelling unit, a uniformly distributed load of 0.7 kn/m. 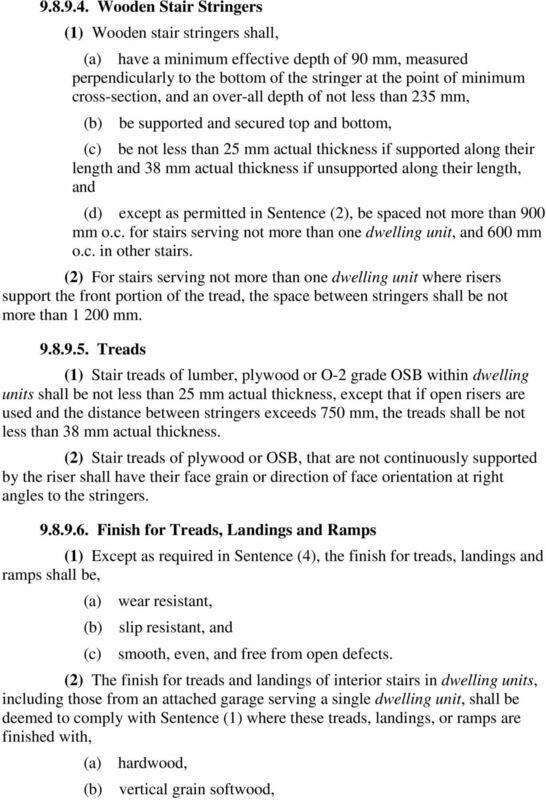 9 (2) Where a handrail serving a single dwelling unit is attached to wood studs or blocking, the attachment shall be deemed to comply with Sentence (1) where, (a) the attachment points are spaced not more than 1.2 m apart, (b) the first attachment point at either end is located not more than 300 mm from the end of the handrail, and (c) the fasteners consist of no fewer than 2 wood screws at each point, penetrating not less than 32 mm into solid wood Guards Required Guards (1) Except as provided in Sentences (2) and (3), every surface to which access is provided for other than maintenance purposes, including but not limited to flights of steps and ramps, exterior landings, porches, balconies, mezzanines, galleries and raised walkways, shall be protected by a guard on each side that is not protected by a wall for the length where, (a) there is a difference in elevation of more than 600 mm between the walking surface and the adjacent surface, or (b) the adjacent surface within 1.2 m from the walking surface has a slope of more than 1 in 2. (2) Guards are not required, (a) at loading docks, (b) at floor pits in repair garages, or (c) where access is provided for maintenance purposes only. 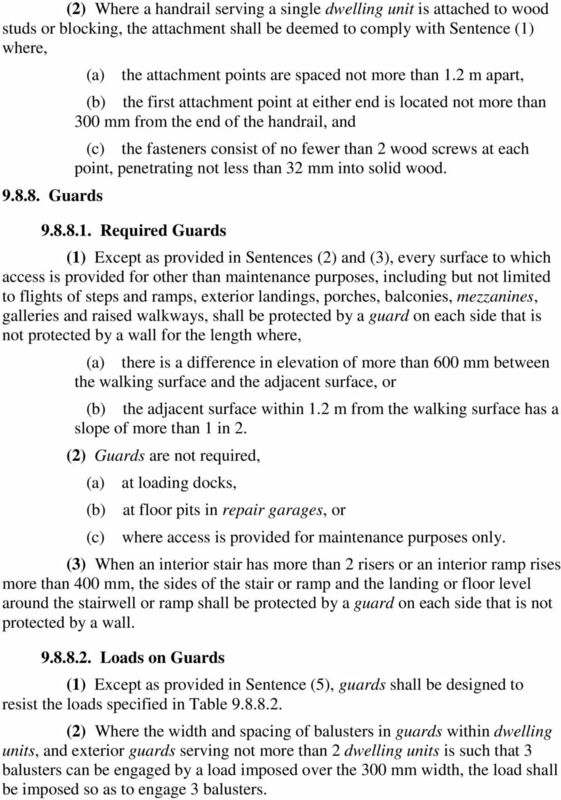 (3) When an interior stair has more than 2 risers or an interior ramp rises more than 400 mm, the sides of the stair or ramp and the landing or floor level around the stairwell or ramp shall be protected by a guard on each side that is not protected by a wall Loads on Guards (1) Except as provided in Sentence (5), guards shall be designed to resist the loads specified in Table (2) Where the width and spacing of balusters in guards within dwelling units, and exterior guards serving not more than 2 dwelling units is such that 3 balusters can be engaged by a load imposed over the 300 mm width, the load shall be imposed so as to engage 3 balusters. 10 (3) None of the loads specified in Table need be considered to act simultaneously. (4) For guards within dwelling units and for exterior guards serving not more than 2 dwelling units, Table need not apply where the guard construction has been demonstrated to provide effective performance. 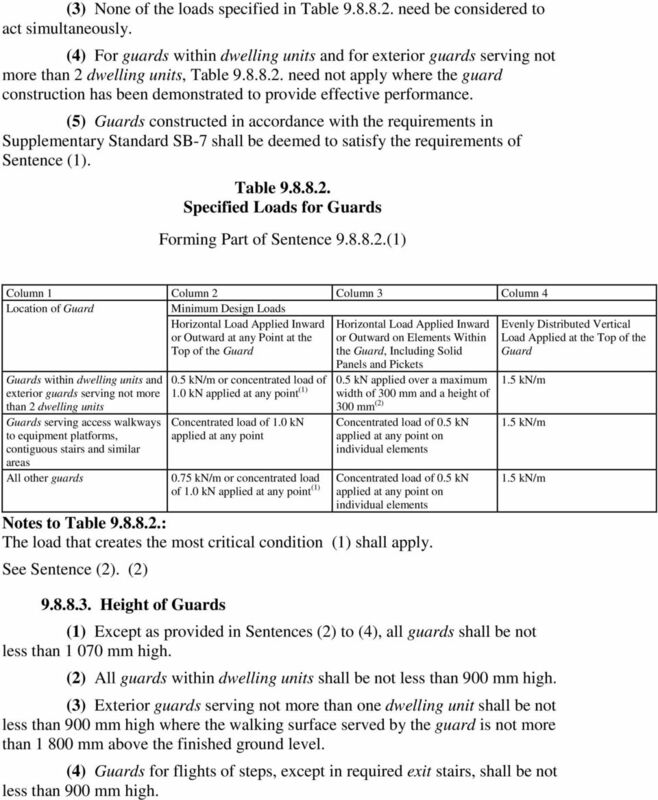 (5) Guards constructed in accordance with the requirements in Supplementary Standard SB-7 shall be deemed to satisfy the requirements of Sentence (1). Table Specified Loads for Guards Forming Part of Sentence (1) Column 1 Column 2 Column 3 Column 4 Location of Guard Minimum Design Loads Horizontal Load Applied Inward or Outward at any Point at the Top of the Guard Guards within dwelling units and exterior guards serving not more than 2 dwelling units Guards serving access walkways to equipment platforms, contiguous stairs and similar areas All other guards Horizontal Load Applied Inward or Outward on Elements Within the Guard, Including Solid Panels and Pickets 0.5 kn/m or concentrated load of 0.5 kn applied over a maximum 1.0 kn applied at any point (1) width of 300 mm and a height of 300 mm (2) Concentrated load of 1.0 kn applied at any point 0.75 kn/m or concentrated load of 1.0 kn applied at any point (1) Concentrated load of 0.5 kn applied at any point on individual elements Concentrated load of 0.5 kn applied at any point on individual elements Notes to Table : The load that creates the most critical condition (1) shall apply. See Sentence (2). (2) Height of Guards Evenly Distributed Vertical Load Applied at the Top of the Guard 1.5 kn/m 1.5 kn/m 1.5 kn/m (1) Except as provided in Sentences (2) to (4), all guards shall be not less than mm high. 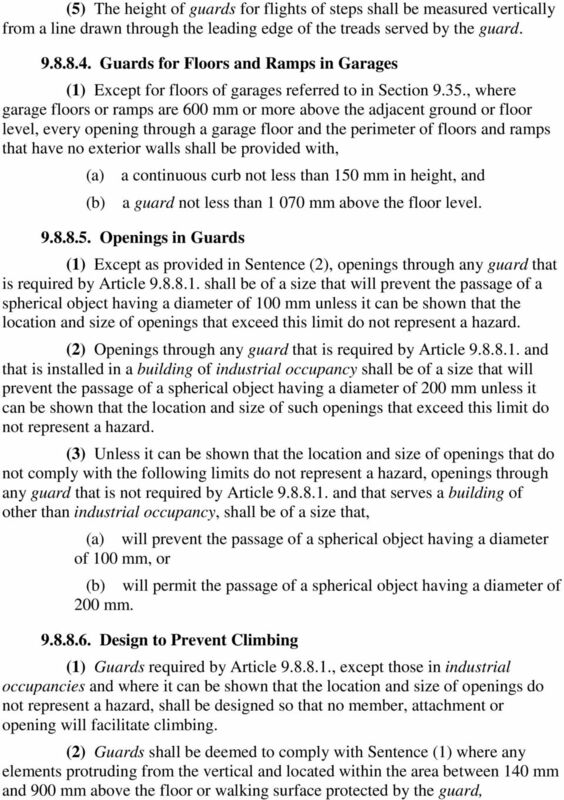 (2) All guards within dwelling units shall be not less than 900 mm high. (3) Exterior guards serving not more than one dwelling unit shall be not less than 900 mm high where the walking surface served by the guard is not more than mm above the finished ground level. 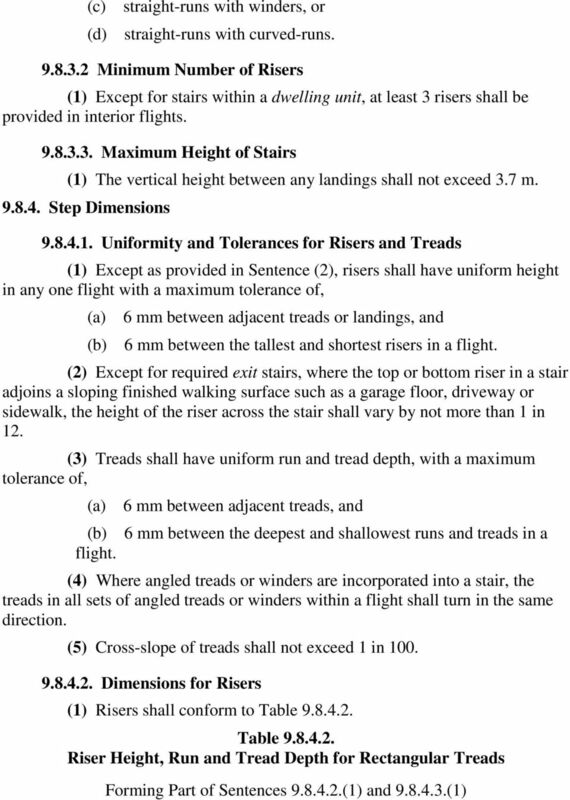 (4) Guards for flights of steps, except in required exit stairs, shall be not less than 900 mm high. 12 (a) are located more than 450 mm horizontally and vertically from each other, (b) provide not more than 15 mm horizontal offset, (c) do not provide a toe-space more than 45 mm horizontally and 20 mm vertically, or (d) present more than a 1-in-2 slope on the offset Glass in Guards (1) Glass in guards shall be, (a) safety glass of the laminated or tempered type conforming to CAN/CGSB-12.1-M, Tempered or Laminated Safety Glass, or (b) wired glass conforming to CAN/CGSB M, Wired Safety Glass Construction Loads on Stairs and Ramps (1) Except as required in Articles and , stairs and ramps shall be designed for strength and rigidity under uniform loading criteria to support specified loads of, (a) 1.9 kpa for stairs and ramps serving a single dwelling unit, and (b) 4.8 kpa for other stairs and ramps Exterior Concrete Stairs (1) Exterior concrete stairs with more than 2 risers and 2 treads shall be, (a) supported on unit masonry or concrete walls or piers not less than 150 mm in cross section, or (b) cantilevered from the main foundation wall. 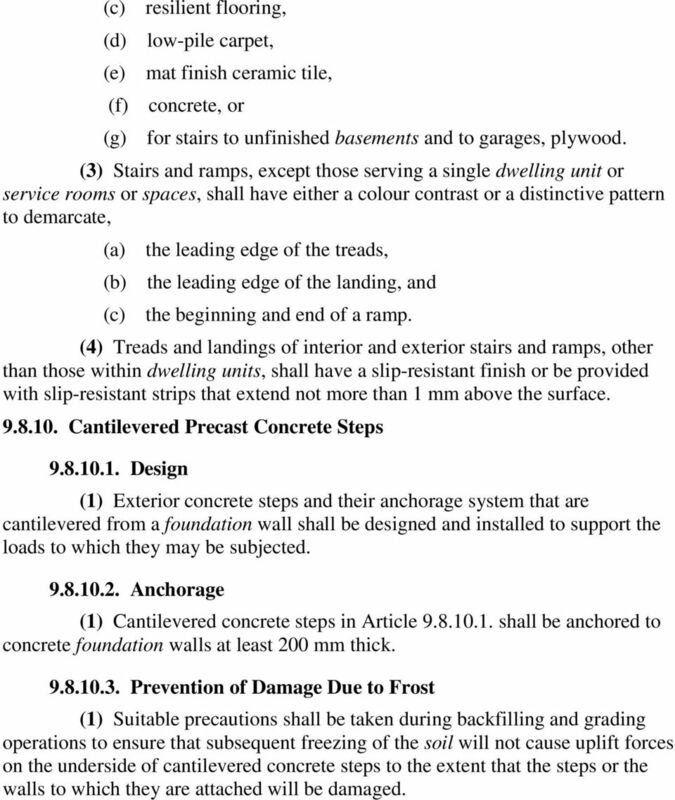 (2) Stairs described in Sentence (1), when cantilevered from the foundation wall, shall be constructed and installed in conformance with Subsection (3) The depth below ground level for foundations for exterior steps shall conform to the requirements in Section Exterior Wood Steps (1) Exterior wood steps shall not be in direct contact with the ground unless suitably treated with a wood preservative. 14 (c) resilient flooring, (d) low-pile carpet, (e) mat finish ceramic tile, (f) concrete, or (g) for stairs to unfinished basements and to garages, plywood. (3) Stairs and ramps, except those serving a single dwelling unit or service rooms or spaces, shall have either a colour contrast or a distinctive pattern to demarcate, (a) the leading edge of the treads, (b) the leading edge of the landing, and (c) the beginning and end of a ramp. (4) Treads and landings of interior and exterior stairs and ramps, other than those within dwelling units, shall have a slip-resistant finish or be provided with slip-resistant strips that extend not more than 1 mm above the surface Cantilevered Precast Concrete Steps Design (1) Exterior concrete steps and their anchorage system that are cantilevered from a foundation wall shall be designed and installed to support the loads to which they may be subjected Anchorage (1) Cantilevered concrete steps in Article shall be anchored to concrete foundation walls at least 200 mm thick Prevention of Damage Due to Frost (1) Suitable precautions shall be taken during backfilling and grading operations to ensure that subsequent freezing of the soil will not cause uplift forces on the underside of cantilevered concrete steps to the extent that the steps or the walls to which they are attached will be damaged. FONTANOT BRINGS OUT A LINE OF STAIRCASES FOR DO-IT-YOURSELF ENTHUSIASTS. 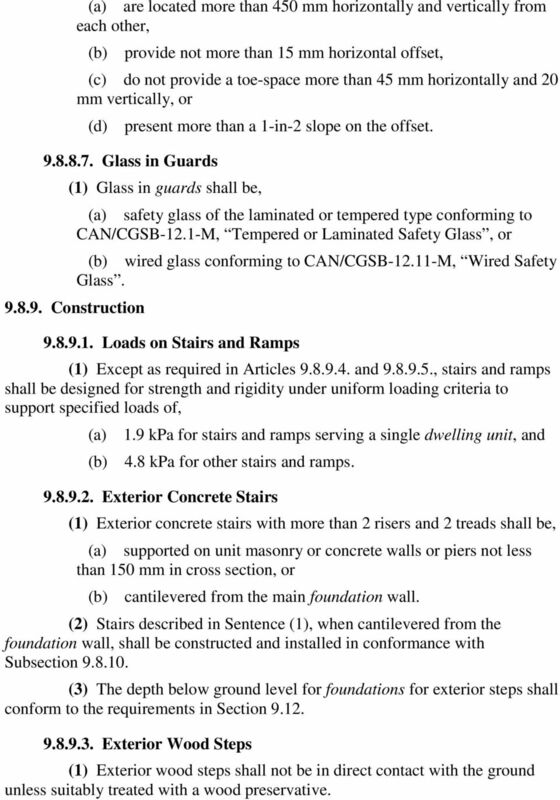 Chapter 629 PROPERTY STANDARDS ARTICLE I Definitions; Application 629-1. Definitions. 629-2. Application. ARTICLE II Property Standards Committee 629-3. Property Standards Committee; appeals; fees. 629-3.1. WHERE DO I PUT A RAMP? This insert is intended as a pocket guide to building a ramp for residential use. We have condensed information contained in An Accessible Entrance: Ramps, an excellent publication written by Design Coalition. Vertical communications. Building structures 2 Ing.Marcela Pavlíková, CSc.